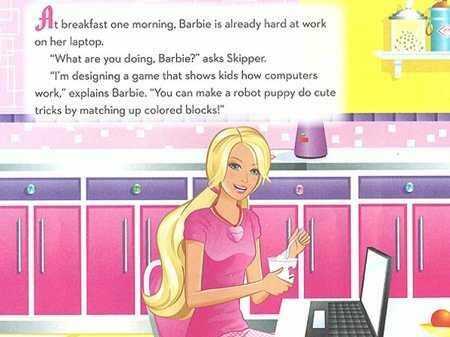 Barbie is known for her career ambitions, but in a new book called, “Barbie: I Can Be a Computer Engineer,” Barbie can barely do her job. She is portrayed as an inept programmer who inadvertently plagues her friend’s computer with a virus and can’t fix a bug without help from a man. The book implies that Barbie can only contribute to the design of the game she’s working on, rather than its more complicated technical structure. We first saw the book at The Daily Dot. “Once again, women programmers are shafted by the toy industry who insists computers are toys for boys. This has already put generations of women in challenging situations when they enter university computer science programs. This book could do something to change that. but, no. The book is written by Susan Marenco and published by Random House, and was written to accompany a physical Computer Programmer barbie doll that comes carrying a hot pink laptop.